What’s Wrong With This Job Growth Picture? I’ve recently written and spoken about the declining trend in New Hampshire’s rate of job growth relative to the state’s past performance and relative to the growth of neighboring and states across the country (as an aside, suggesting that the emperor’s new vestments may not be as fine as others envision is not the best way to relax and enjoy the procession). Pointing out that NH shouldn’t feel entitled to superior economic performance has generated a fair amount of “discussion” but the analysis is not especially useful if it simply reinforces hardened ideological positions about how to best facilitate prosperity in the Granite State. One way to help avoid that is to not end our analysis of job growth in NH by simply noting disturbing trends. We need a better and more consensus understanding of the causes of NH’s slow rate of job growth and of its decline relative to other states. In the first ever Trend Lines blog post I begin by asking a basic question: Could the most recent job growth picture in NH be distorted by numbers that will later be revised? Monthly job growth counts are based on surveys of employers and they can be revised significantly, especially in small states, when they undergo their annual “benchmark revisions” early each year. 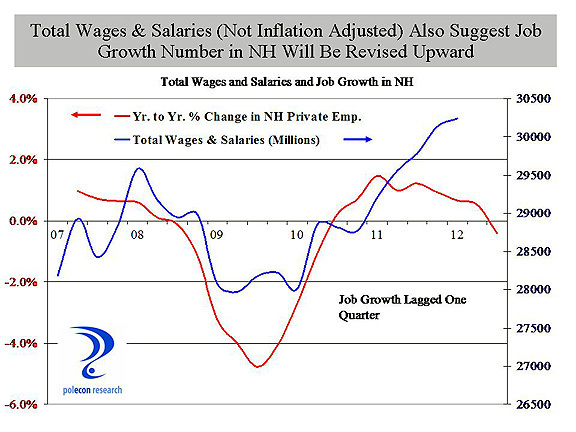 There is some evidence that NH’s job growth will be revised significantly upward. In NH, and the nation, there is a strong statistical relationship between the volume of help wanted advertising and the annualized rate of job growth. The chart below shows the relationship between on-line help wanted advertising in NH (the number of ads per 100 people in the labor force), and the year-over-year rate of job growth in the state. The strong relationship is evident except in the most recent data from the past year or so. 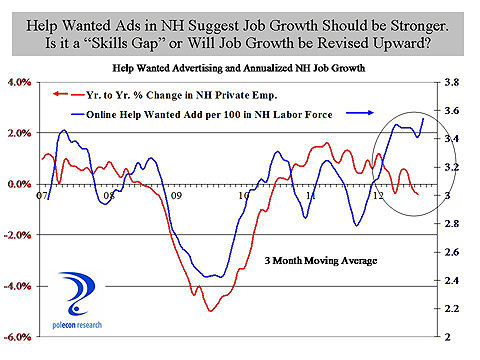 Two potential reasons for the recent break in the relationship between help wanted advertising and job growth in NH are the so called “skills gap,” as well as the possibility that the help wanted and job growth relationship has not changed and the recent job growth numbers will be significantly revised upward. The belief that there are many jobs being offered for which there are not enough qualified job seekers has profound implications for the policies necessary to grow NH’s economy. There is a skills gap but I am skeptical that it could have such a dramatic impact over just the past year. In addition, the occupations comprising help wanted ads in NH don’t suggest a dramatic increase in the skills gap over the past year. In later posts and writings I will be looking further at the “skills gap” issue. Another possibility, that the jobs data is wrong and will be revised upward early next year, is real, but that doesn’t mean the revisions will show NH is again outperforming its neighbors or the nation. It just means we will look less bad over the past year or so than we do right now. One indicator that job growth will be revised upward in NH is the growth in wages and salaries in the state. The chart below shows that wage and salary growth (not adjusted for inflation) is indicating a stronger labor market than are the job growth numbers. This entry was posted on October 10, 2012 at 4:59 pm and is filed under Uncategorized. You can subscribe via RSS 2.0 feed to this post's comments. Nice work Brian. I look forward to your future post on this topic. Perhaps you can also talk about the impact that the aging workforce/retirees is having on the skills available in the workforce? How is this impacting our ability to grow existing business, having businesses founded here in NH, and attracting business to NH?